You've heard of Brangelina (Brad Pitt and Angelina Jolie for the uninitiated), well here's the new power couple Blunderpants! Crime fighting duo of the 21st Century as long as they're back at home for their cup of cocoa and a digestive biscuit by 7.30 pm at the latest! 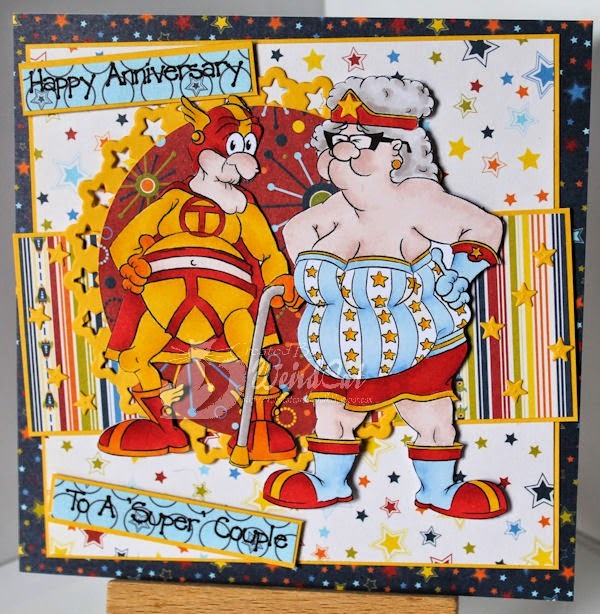 You can find Blunder Woman HERE and her trusty octogenarian sidekick Captain Thunderpants HERE, hope you all have a great weekend, we're having a street party here on Saturday for no other reason than just because!. It's Saturday night and Steven has dug out his flares and afro wig and is off to the local disco for a boogie! Blunder Woman makes an unscheduled but dramatic appearance. She could do with coming round to my house to sort out my kids as they are driving me mad this half term and its only Tuesday! Sentiment taken from Funny Sentiment Sheet 02. Good morning hope you are enjoying the bank holiday weekend. 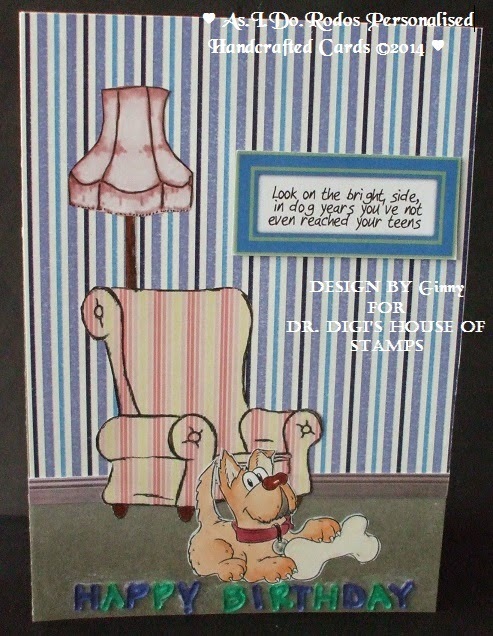 Today's card is for Dr Digi House of Stamps is Trotsky He is alone in the house, and feeling very pleased with himself! Trotsky has just dug up a bone he buried three months ago and now it smells delicious!!! The sentiment is from Funny sentiment sheet 02 the Armchair and Lamp I have paper pieced. 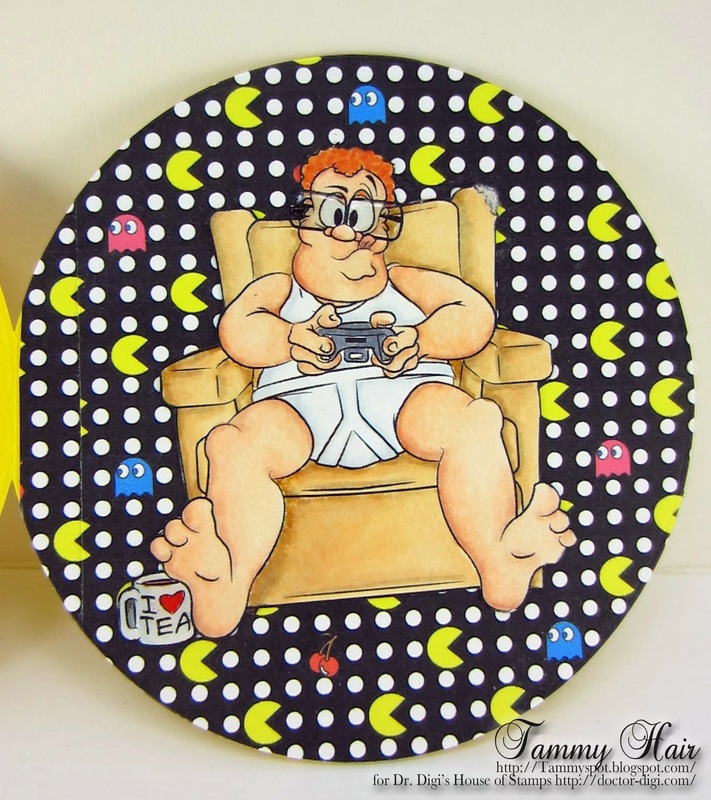 It's Videogame Vince from Dr. Digi's House of Stamps, sitting in his favorite chair, enjoying his favorite pastime while sipping his favorite brew! 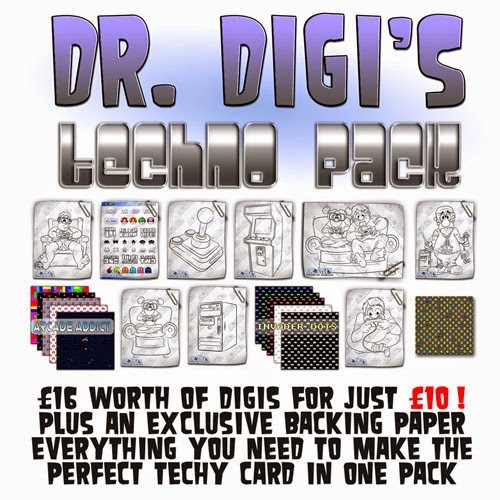 If you have family and friends who are fans of video games, Dr. Digi's House of Stamps Techno Pack includes everything you need, eight digis, one sentiment sheet, two paper packs and the bonus paper I used on today's card! 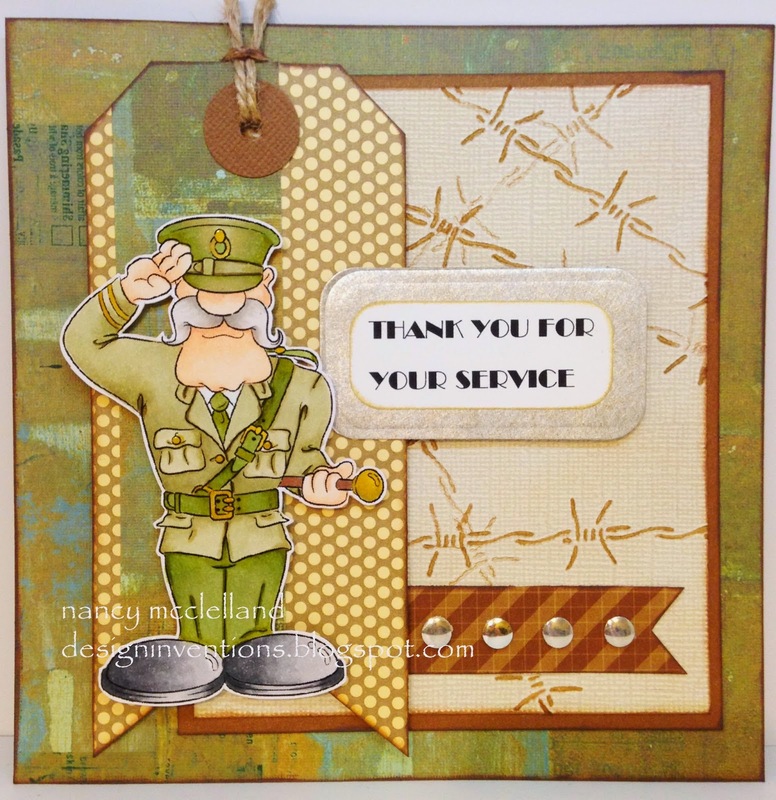 Here we go, with my DT card for this week. I'd like to introduce you to Beach Bum Bob....he's enjoying some rays and a nice cool drink, and he wants you to know...retirement is a blast! I've used a sentiment from one of the new sentiment sheets and will probably give this as a birthday card, but I think it would also make a great retirement card. Ever since I saw these images I have had the Pac-Man noise running through my head so thanks Dr Digi for that! I have sons, they have friends, they are all gamers in some way shape or form, be it PC, Playstation or XBox. 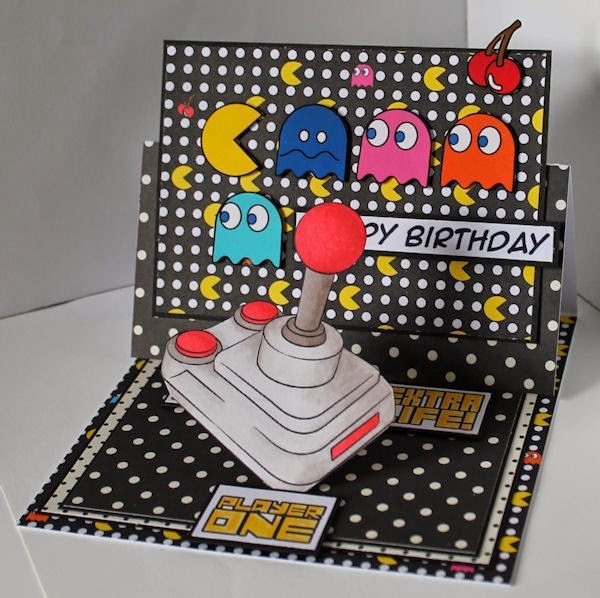 However when I was a teenager Pac Man was about as good as it got, I can remember afternoons spent on Eastbourne Pier either playing or watching someone play Pac Man in the arcade! I had fun making this card! To our UK friends I hope you have an excellent bank holiday weekend, and the rest of you an equally excellent if slightly shorter weekend! 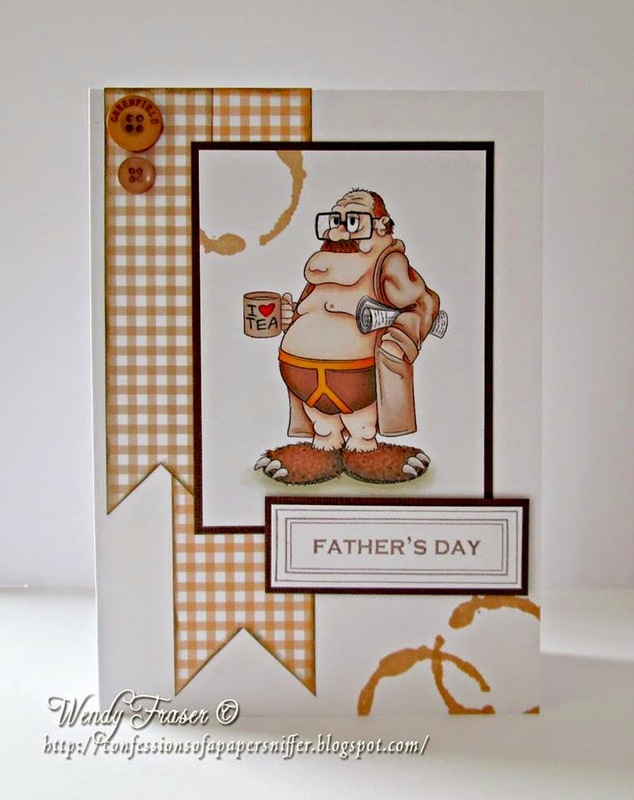 Alex over at the Outlawz challenge blog has decided a nice game of golf is the perfect way to celebrate Fathers day, with a little help from Hole in One Hal of course. It's my Wednesday to post and i'm going to get as much in as possible =0) first off i feel like throwing out a few spot prizes! 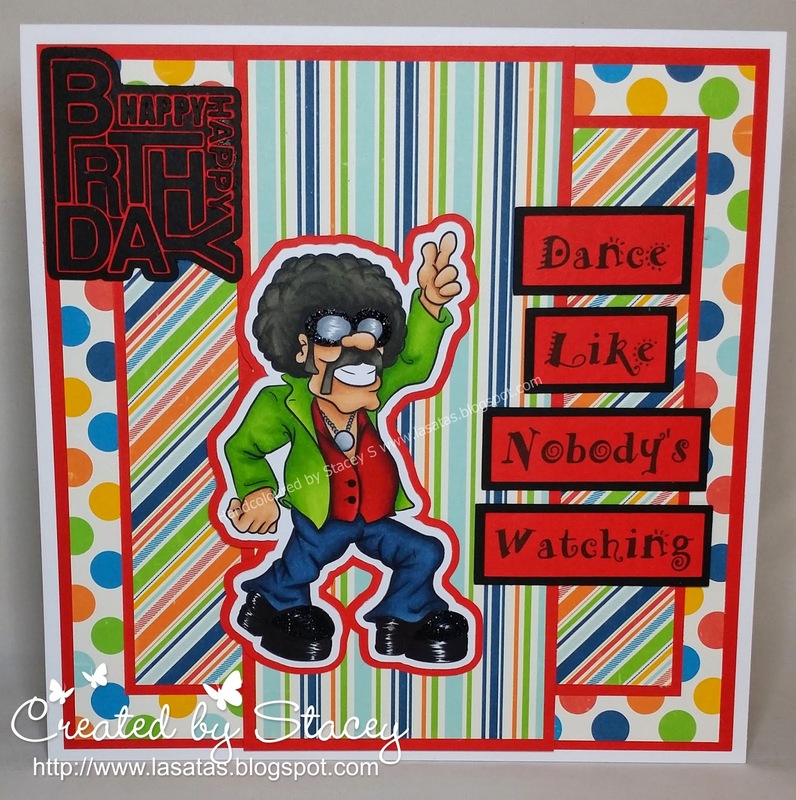 We've not had a spot prize for a card posted for a while so I think Wendy's smashing card using Weekend Walter is certainly a worthy winner... well done Wendy..
Hilary Williams was our 380th Facebook like, so she's won her self a spot prize too! ........In your case a really high one! Professor Dummkopf doesn't mince his words! Sentiment taken from Birthday Sentiments Sheet 01. 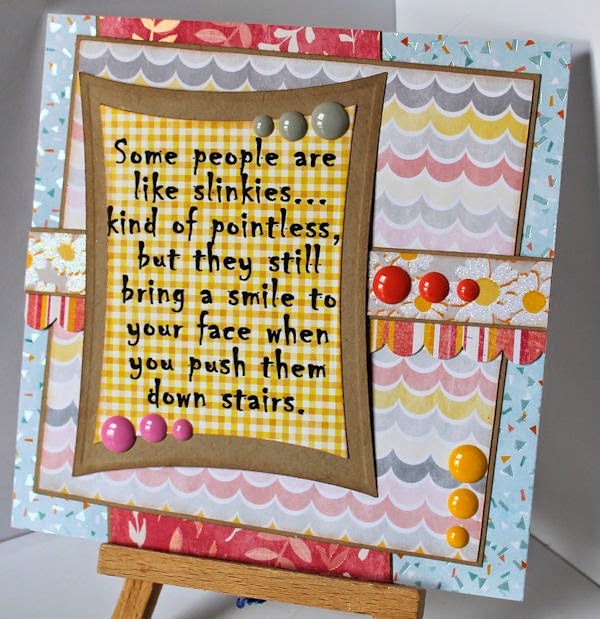 And just incase your eyesight is fading, the sentiment is rather large on the card! 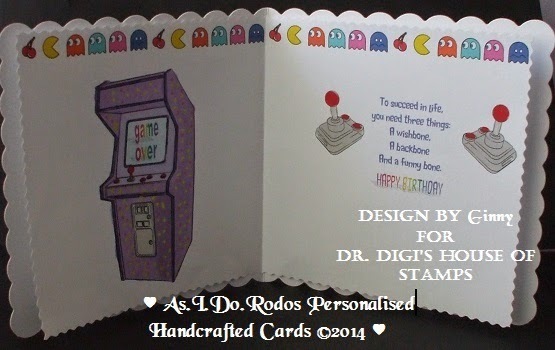 Today's card is for Dr Digi House of Stamps is Videogame Vince! Weekends Vince does not even get dress there in his classic Y fronts he has nothing better to do that concentrate on the latest video-game cup of tea by his side he is a happy bunny. 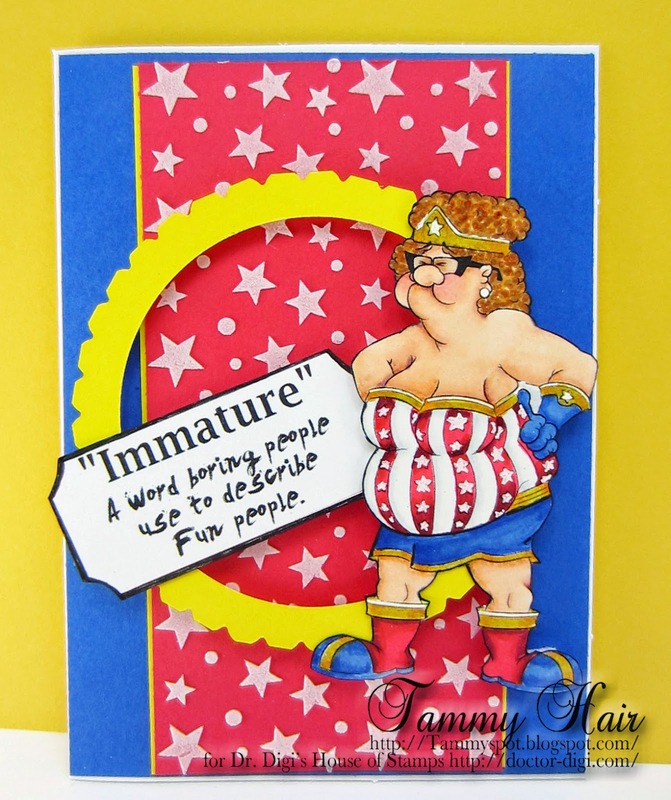 Today I'd like you to meet Blunder Woman from Dr. Digi's House of Stamps, Captain Thunderpants', better half! As the devoted spouse, she follows right behind the Captain with a broom and his bed pan! After a week with lots of work Deirdery loves to get some realxingtime. She love to take a bath and afterwards it would be great to get a massage. 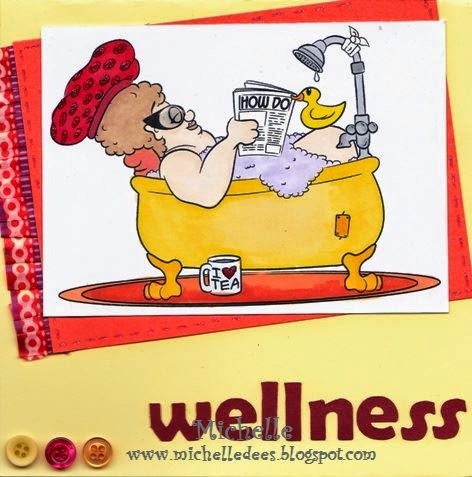 Or maybe she will go to a wellnesscenter and go in the sauna and then a bath?? For her it doesn't matter mainly she would like to be not disturbed. Here can you find Bath Time Deirdery. And here you find lots of other great stamps. Have a relaxing weekend and see you next time. You can find this sentiment on the sentiment sheet HERE and other funny sentiment sheets HERE and HERE. I think the UK is having summer this weekend so I am away to dig out the suntan lotion, flip flops and floppy hat! 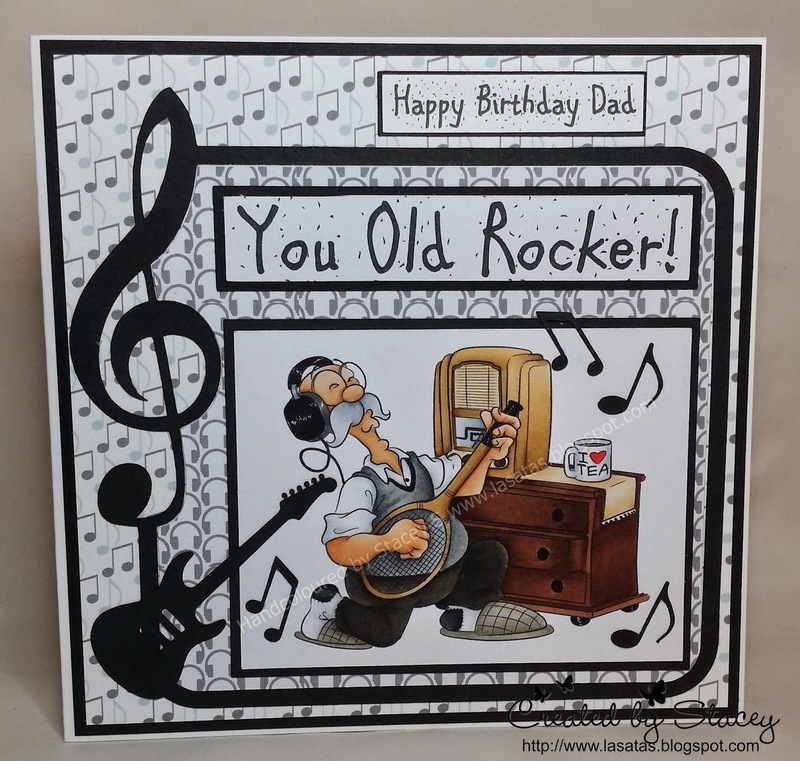 Hi everyone, Dierdery has gone to the shops so Derek has slipped on his favourite singer, grabbed the nearest thing to a guitar and for one day only Derek IS Derek Clapton! He sure is busting some moves - notice he has a strong cuppa waiting for him after - he can't keep up the pace these days without a good cuppa! Derek Clapton is available from the store and more details on this card can be found over on my blog. It's not just women with a thing for shoes. Ambrose is a connoisseur of slippers. 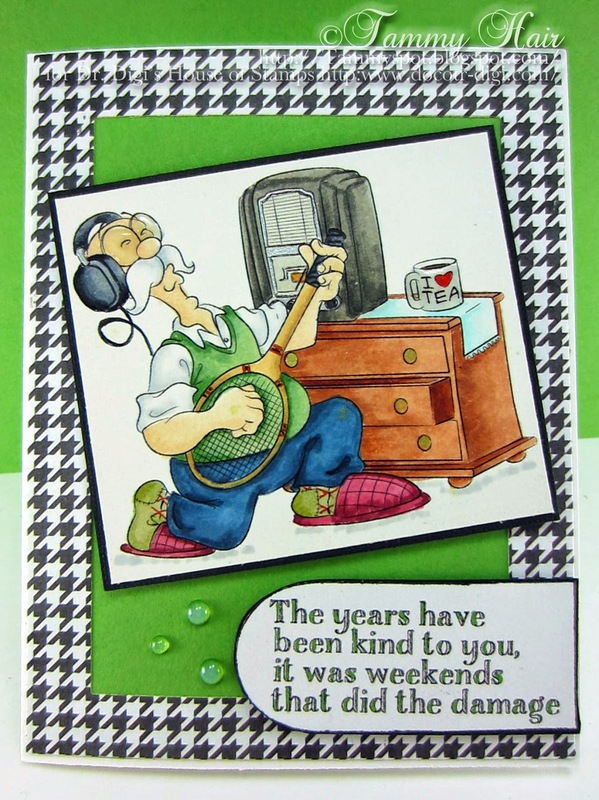 Shuly has made this fab card with Ambrose Dunderton's slipper obsession in mind. A Perfect Sunday need the perfect slippers, and Trotsky, his faithful terrier of course. Well, what do you send a bloke who has it all? 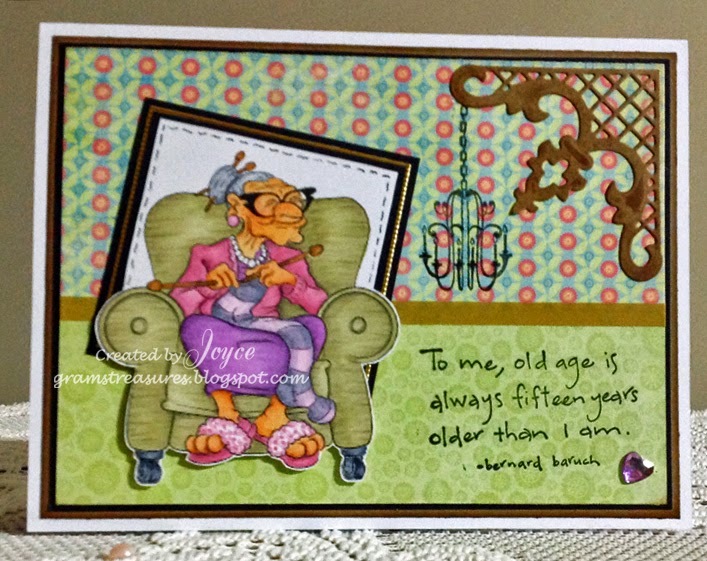 A Winning Birthday card of course! Made with the Trophy image and computer generated text its sure to be a hit! And the best thing is, the image is in the cheapies section so its a right bargain! Ambrose King of The Waves..
Today's card is for Dr Digi House of Stamps is Ambrose King of The Waves.. Here he is ladies, none other than Derek Clapton from Dr. Digi's House of Stamps singing his heart out in your honor! Oh and he doesn't care if you're a mother or not, he just wants you to enjoy the day! So sing it Derek, Happy Mother's Day to you! Knitting is Nora's favourite pastime, and socks are her specialty. She loves to make everyone a pair for Christmas, and no two pair are the same....in fact no two socks are the same! You can find Knitting Nora at Dr Digi's House of Stamps, and she's definitely good for a smile. The perfect card to go with a gift of pretty yarn. As a Mum of three boys it has to said that all you can do sometimes is look, raise your eyebrows, decide you have no words and go and make a cup of tea or reach for something stronger!! We have had pans on head, bowls on head, underwear on head (The 'I am Pantman' phase), rubbish bins on head but rarely hats! 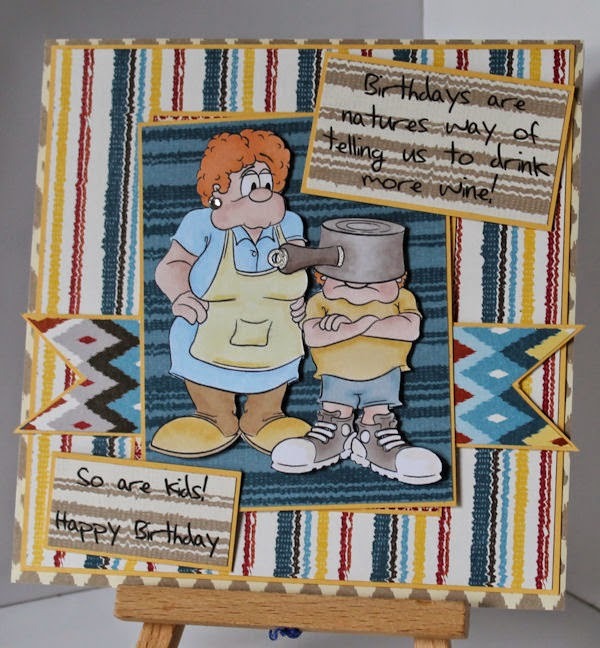 You can find Kid Pan Head and his poor, frustrated Mum HERE and the Birthday Sentiment is on the Birthday Sentiment Sheet HERE although I added the second part. Stacey's gone and got her self a cracking new job, so she's posting fortnightly now, which means I'm back to share some challenge cards, you lucky people you. 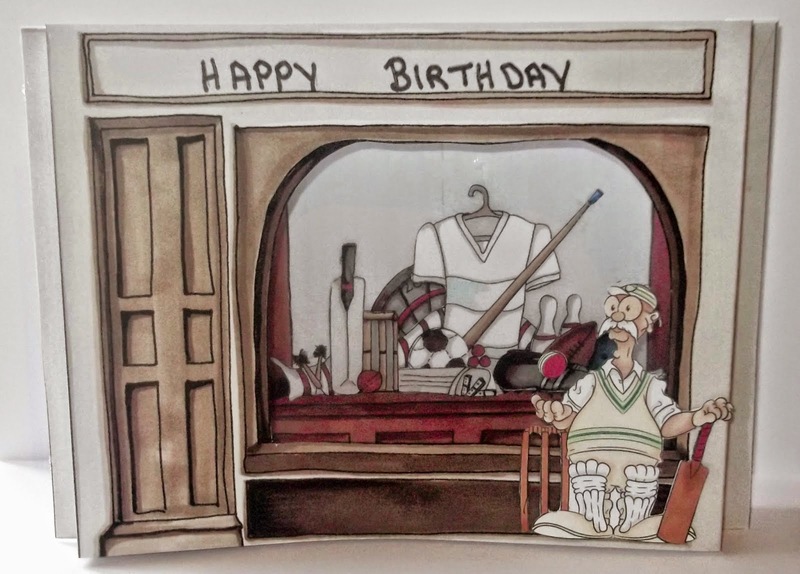 Caz (or Bunny, you choose ) used Cricket Derek to make this fab card, which for some reason makes me think of Mr, Benn ( a marvelous kids show from my youth for those who dont know ) which can only be a good thing. Ah, Malcolm really misses his Chopper. It was his pride and joy and he rode it at great speed through the Municiple Park with the other youths (although he could pass for early 20's he really was pushing 50). Still, he's not lost his touch despite being in his 80's, and here he is popping a back wheel wheelie in his mobility scooter. Still causing mayhem but now on four wheels. Sentiment taken from the Birthday Sentiment Sheet 01. Good morning hope you had a wonderful long weekend. Now one is safe from her… No one can escape from her…It’s Blunder -Woman she is a hilarious romp and a bright characters. There she is in her shorts and wellies and she only just manage to fit into that top. Recently Crouching Tiger Hidden Dunderton from Dr. Digi's House of Stamps turned the karate world upside down when he appeared wearing a gi fashioned to his personal preferences. The Crouching Tiger always felt with his white hair and beard that a white gi washed him out. 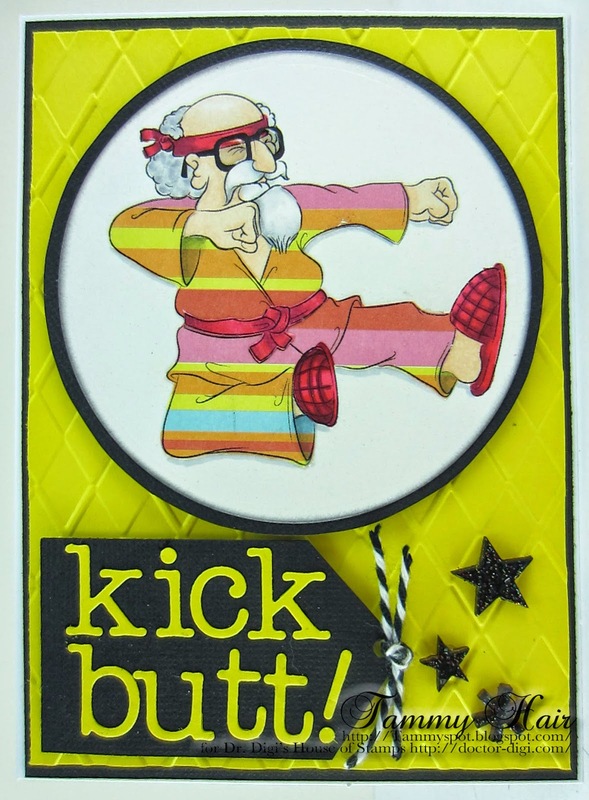 Now he sports a colorful gi more to his liking with matching headband and slippers! Did you already grab out your BBQ? We did and Bill too. He loves to grill sausages and hopes they taste good. 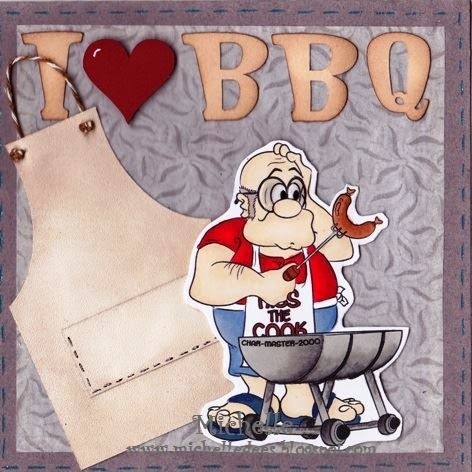 If you like to make a card with BBQ Bill, here can you find him. And there a lots of more great digi's for men and other occasions. 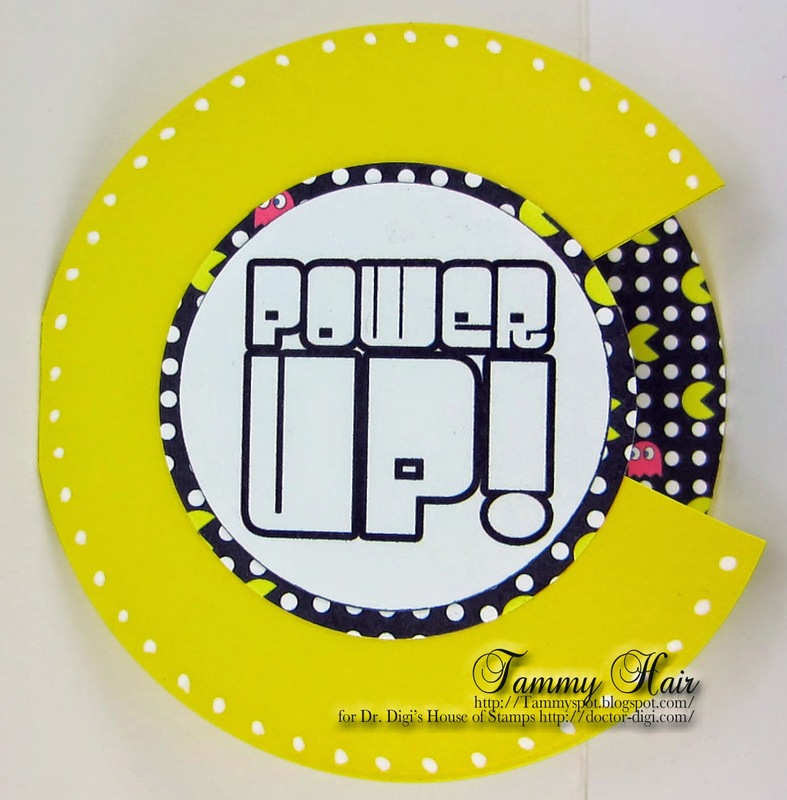 See more how I made the card? Come an take a look at my blog . Hangover Hannah Or Is She? Poor Hannah, she appears to be quite ill following a stonking night out, it must be a touch of the flu or that is what she told her boss this morning anyway! She only had a couple of bottles glasses! I'm sure most of us have had days like this one. 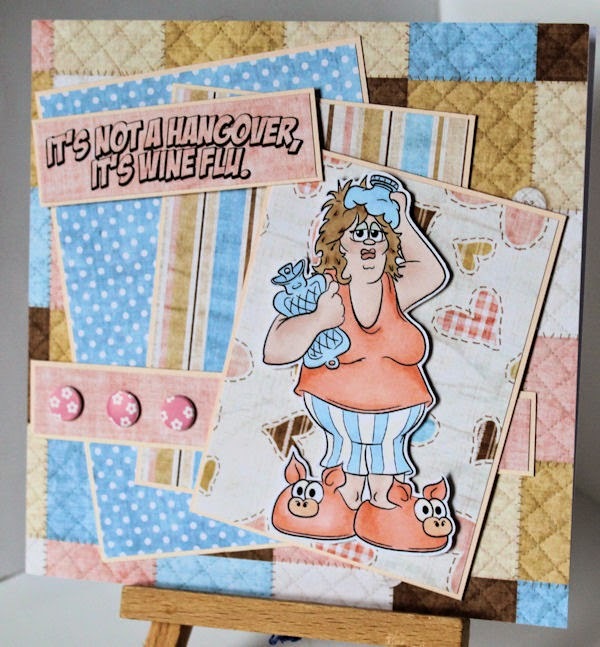 You can find Hangover Hannah HERE and guess where I got the sentiment from, yep, it's a new Dr Digi sheet of Funny sentiments which can be found HERE, I am trying to think of a card where I can use the slinky phrase! 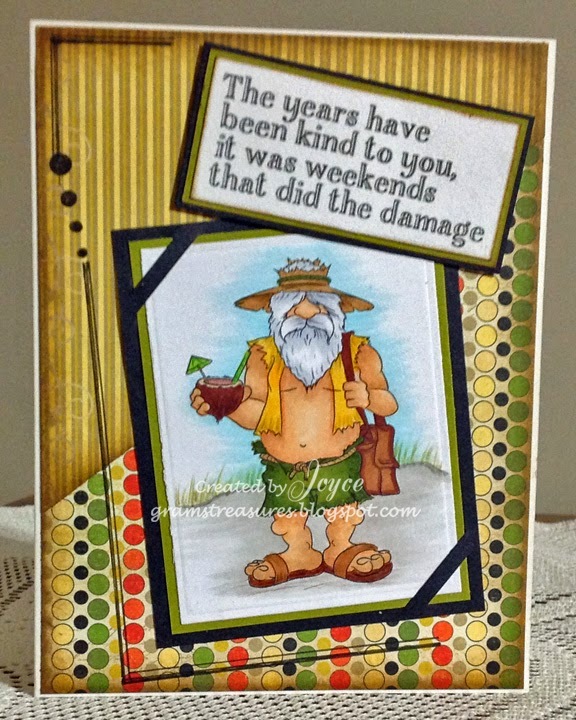 Hi everyone, Stacey here with another card for you all featuring my main main - Derek! Derek Dunderton is all ready for his match this weekend in his new strip. Hes determined his team is going to win and stay up this season (unlike my husband who is crying because his team (Barnsley) look like they are going down! 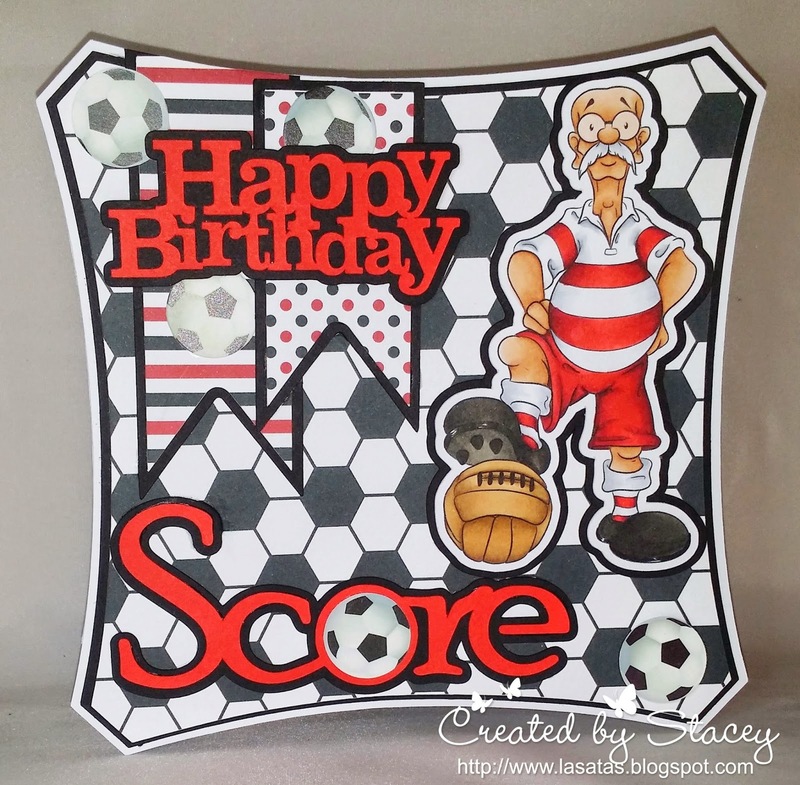 Dunderton Acedemicals FC is available from the Dr Digi Store. Be sure to check out the latest new stamps on there too.